A Closer Look at Butler’s MR-24 Roof System | JG Bowers, Inc.
As we announced in one of our earlier blog posts, JGBowers, Inc. has partnered with Butler Manufacturing. With Butler’s proven ability in the construction industry and JGBowers, Inc.’s position as commercial construction experts, the pairing is a natural evolution of our commitment to changing the game. Today, we’re going to take a closer look at one of Buter’s more impressive innovations: the MR-24 Roof System. What is the MR-24 Roof System? The most important thing to know about the MR-24 Roof System is that it is, in fact, a roof. It does all of the things that one would typically expect a roof to do, however, there are quite a few important distinctions that make the MR-24 system special. 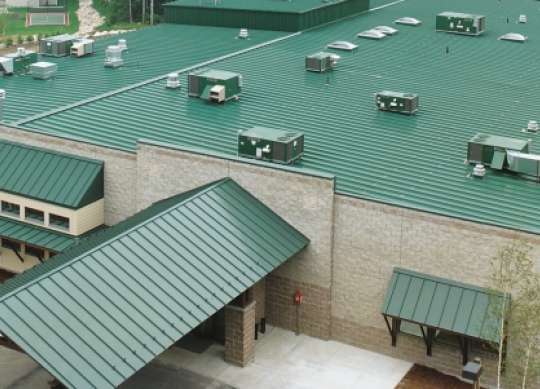 First off, the MR-24 Roof System is the industry’s finest standing-seam metal room system. It is the first – and only – roof to seam panels with a 360 degree Pittsburgh double-lock seam that is finished in the field with Butler’s unique Roof Runner seaming machine. Where traditional metal roof panels are held in place with exposed, self-drilling fasteners, the MR-24 system eliminates that need by using factory-punched panels, backup straps and closures. Furthermore, the MR-24 Roof System utilizes staggered panel splices to eliminate leaks and create a more dependable lap detail. As a result, Butler’s system is not only more resistant to the elements and less prone to leakage, it retains its capacity for roof movement. Second, because of its unique assembly, the MR-24 Roof System provides superior protection and long-term savings. As it is less prone to leakage, the system degrades at a slower rate than competitors’ roof panels. The precision engineering of the MR-24 system contributes to a low-maintenance, energy efficient design that ensures there is no deterioration due to thermal cycling. This means that, over time, users of the system can expect to save up to 90% on roof maintenance costs. If you like roofs, we’re sure that you’re going to love Butler’s system. More importantly, we’re certain that you’re going to benefit from the system’s long-term protection, savings and hassle-free maintenance. No matter if you’re reroofing your barn, replacing a worn standing-seam metal roof or outfitting your industrial manufacturing plant in an effort to defend the precious cargo contained therein, we’re certain that the MR-24 system will meet – or exceed – your expectations. No joke, though, every building needs a roof. A building without a roof is a courtyard and that’s no kind of building at all. So if you’d like to start saving on your facility’s maintenance costs or stop worrying about that leaky roof, give us a call and talk to us about how JGBowers, Inc. can take your roof to the next level. Okay, we’ll leave it at the same level. It’ll be way better, though, we promise.